This is a step to be taken after the Prop Shaft has been removed. Link here for the process. To get the engine out you will need to remove the prop shaft, then the gearbox, then the engine. I wasn’t able to take photos at this point as I smothered in grease and grime. I shall try to take some pictures of the assembly which will just be the reverse process. Firstly make sure the car is high enough up in the air to allow the gearbox to be removed from under the car. This is a two man process to remove the gearbox. Remove all connections to the gearbox, by either the throttle linkage for kick-down bar or cable. Remove the electrics connection for the neutral safety switch. Remove the linkage for the gear shifter. by far the worst job is to remove the ATF pipes that run up the front of the car to the bottom of the radiator. 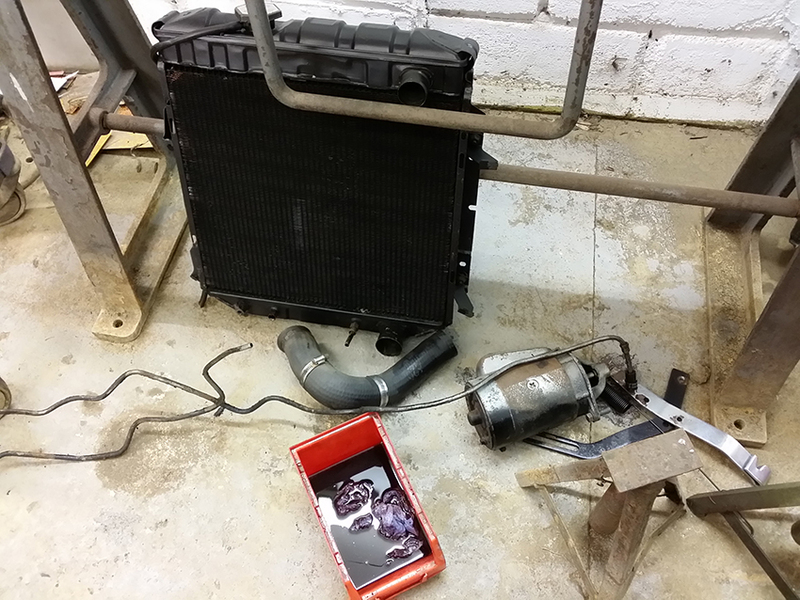 Remove the couplings for the feed and return pipes to the bottom of the engine. Watch out for the fluid leaking out. The pipes to the gearbox are difficult to get to at the top and a crows foot spanner will be required to remove it. The other pipe to the side can just be got to with an open-ended spanner. Unfortunately the muppett who replace the torque converter couldn’t be bothered to remove the steel pipes and just hacksaw through them near the box. The repair was a rubber tubing over each end and clamped in place, now I know where the ol’ girl was leaking from. Once the pipes are free you will have to bend and distort the pipes in order to get them free from the engine and gearbox. Note the cut pipes for the transmission fluid with the rubber pipe on the end. From the engine side the starter motor will need to be removed as well, this is held in place by two bolts, one top and one bottom. the starter was a lot heavier than I expected, so be careful. Depending on your engine exhaust, you may have to remove the headers or part of the exhausts. I can’t help you here, but you need free access to the bolts. The gearbox bell housing is held on to the back of the engine via six bolts and locating studs. There gearbox is mounted underneath via a bracket with two bolts just behind the gearbox sump, and two longer bolts that hold the bracket to the chassis. You might have a metal plate next to the starter that is held in place by two smaller bolts, remove the plate to expose the flywheel. The flywheel has four bolts located onto the toque converter. Loosen the bolt and then turn the engine over by a breaker bar and socket in the crank pulley. Turn the engine over to expose the next nut and loosen. Repeat until all the nuts are loosened. I done it this way because at least you know all the nuts are free and ready to remove. You can off course remove the nuts completely as you turn the engine over. Once all the nuts are removed you will be exposing the four studs from the torque converter side. Push the studs through the flywheel, if they are stuck, you may have to use a soft faced hammer to get it moving. Remove the bolts from the bell housing, two at the top can be removed from the engine bay, the other four have to be removed from the underneath. Once the bolts are removed from the bell housing move to the underneath again and in the middle of the bracket remove the two nuts in front of the gearbox sump. Now get a jack under the car and support the weight of the gearbox. Gently move the gearbox apart from the engine. Once they have separated remove the larger chassis bolts that hold the bottom mounting in place. Support the gearbox down so it does not roll of the jack, once it is close to the ground remove the gearbox from under the car.